What's new in our collection? 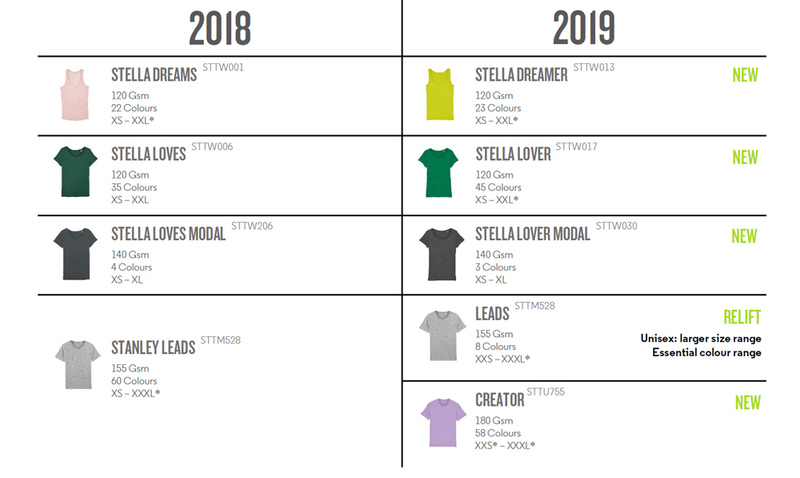 Welcome to the world of Stanley/Stella, this Spring Summer 2019, our collection has progressed to offer you the best timeless products for the next three years. This means that all of our Iconics and Essentials have been reworked and new styles have been added. ICONICS stand the test of time; the forever relevant pieces which are kept in the wardrobe for years because of their premium fabric, attention to detail, and high - quality workmanship. ESSENTIALS are the everyday basic staples with qualitative design features which are cut in lighter fabric weights. To ensure easy understanding of this evolution you can download the 2018/2019 equivalent products pdf in which you refind the 2018 styles and the 2019 styles replacing them. RELIFT indicates that the style is still the same as 2018 but with a different gender (e.g. men to unisex) or a diverse colour range (e.g. from 60 to 8 colours). Copyright 2019 Stanley & Stella. Alle Rechte vorbehalten.